Lovely set of four oak Arts & Crafts Glasgow school dining chairs by Wylie & Lochhead with stylised tulips to backs and round capped columns. 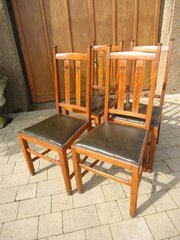 Offered in good condition having been stripped and re finished and upholstered in green leather with a studded border. Just a few old stud holes remain at one edge. We have a matching carver on this site. Height 104cms. Width at front of seat 46cms. Seat height 46cms. Pretty Arts & Crafts pokerwork mirror with a border of roses. 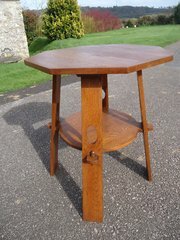 It has is original bevelled edged mirror plate and is offered in good condition with just a little wear to paint. Diameter of frame 46cms. Diameter of glass 29cms. 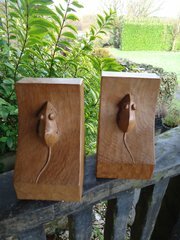 Pair of vintage oak azded "Mouseman"bookends. These measure 15cms high, 9cms wide and 9.5cms deep. Offered in good condition with a very minor chip to one at base. 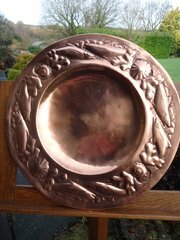 Postage included within the U.K.
Arts & Crafts Copper bowl with pewter overlay by Hugh Wallis of Altrincham (1871-1943) His style is unmistakable in putting pewter on copper.. Impressed mark to underside. Height 12cms, Diameter 22cms. Offered inn good condition but with some loss of definition to pattern. First image misleads and appears to have a dent but it id reflection. Large and excellent quality copper fire surround/fender/kerb. The outer measurements are 141cms in length and 41cms deep. The inner length is 120cms with a depth of 21cms. Height 7cms. 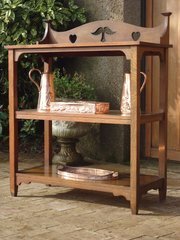 A lovely design to both sides as well as front. 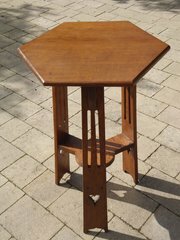 Offered in excellent condition with a minor ding to front left corner. Early Watcombe of Torquay frog on a leaf pulling a very large shell. Although this looks fine from the right side except for a small crack to foot. The right side has been repaired with staples and badly painted plus a large chip. The stands 8cms high, 21cms in lenght and 13cms wide. Early large Arts & Crafts Newlyn charger decorated with fish, shells and sea snails. Not marked as earlier than when the Newlyn mark had to be stamped. It is 39cms in diameter and has a deep well which has a few dings. 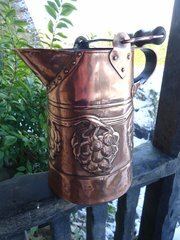 Offered in good condition with minor loss of detail owing to over cleaning.